Researchers, graduate software engineering students, and practitioners with an interest in data science. Ekrem Kocaguneli received his Ph.D. from the Lane Department of Computer Science and Electrical Engineering, West Virginia University. His research focuses on empirical software engineering, data/model problems associated with software estimation and tackling them with smarter machine learning algorithms. 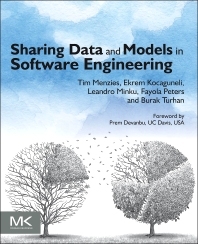 Burak Turhan is a Professor of Software Engineering, University of Oulu, Finland. His research interests include empirical studies of software engineering on software quality, defect prediction, and cost estimation, as well as data mining for software engineering. Leandro L. Minku is a Research Fellow II at the Centre of Excellence for Research in Computational Intelligence and Applications (CERCIA), School of Computer Science, the University of Birmingham (UK). His research focuses on software prediction models, and he is the co-author of the first approach able to improve the performance of software predictors based on cross-company data over single-company data by taking into account the changeability of software prediction tasks' environments. Fayola Peters is a PostDoctoral Researcher at LERO, the Irish Software Engineering Research Center, University of Limerick, Ireland. Along with Mark Grechanik, she is the author of one of the two known algorithms (presented at ICSE’12) that can privatize algorithms while still preserving the data mining properties of that data.